Today is Groundhog Day which means (whether or not the groundhog saw his shadow) there is light at the end of the winter tunnel! So if you or members of your family are still suffering from colds, congestion, or sinus infections, hang in there! And until the weather warms up here’s a super simple and effective way to keep all those nasty bugs at bay! It’s widely believed that the most common reason for cold and flu outbreaks during the colder winter months is the fact that colder temperatures lead to drier air. This dries out nasal passages and without any lubrication, the nose can’t flush out bacteria, which results in a safe haven for germs. Saline nasal spray is a simple remedy that helps to flush out mucus and bacteria. Adding moisture to the nasal passages also helps to combat stuffiness, congestion, and further infection. There are several different options available for using a saline spray. The first is to simply buy a can of saline spray, usually available at any grocery store or pharmacy. This spray from Arm & Hammer contains only water, salt, and baking soda, and works well. However, a can will set you back about $9.00! The other delivery methods for saline spray include reusable nasal spray bottles, and a nasal irrigation pot commonly referred to as a “neti pot.” The nasal spray bottle is used by spraying 2-4 sprays in each nostril (depending on how strong the spray is), and allowing the solution to run out the nose. A neti pot is used by pouring a saline solution into one nostril and allowing it to come out of the other nostril. There’s a small learning curve with a neti pots, but using one can also provide the best results because the solution travels all the way through the nasal passages, potentially clearing more irritants than a spray could. So which of these three options should you choose? 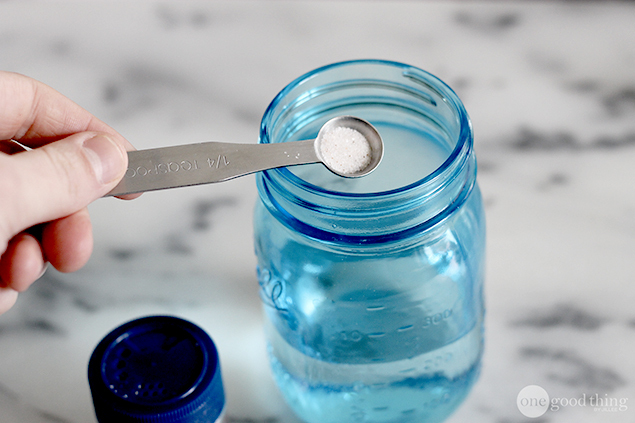 Well, the major advantage of both the reusable nasal spray bottle and the neti pot is that they can be used with a simple homemade saline solution that you can make for pennies! To make the solution, simply combine all the ingredients in a container and shake well until the salt and baking soda have dissolved. Pour the solution into your preferred delivery device and use as needed to manage sinus symptoms. These 8 Simple Ingredients Can Clean Almost Anything! Organizing The Dreaded Pots and Pans Cabinet! I neti pot every time I get sick (knock on wood). For those of you using the 1 oz. refillable nasal spray bottles, how many pumps of the bottle did it take to reasonably rinse your nasal passages? A few years ago I tried the neti pot. While I appreciated the results, I didn’t like the procedure and it plugged up my ears. I’m hoping to get some good results with this less complicated method. Also, does the pump bottle mechanism wear out pretty quickly? I’ve got some bottles on order from Spark. Thanks Jillee! One more question. Because I will be using this solution in a 1 oz. bottle instead of a neti pot, what is the shelf life? Should I put the leftover solution in the refrigerator? Or would I have to make it fresh for every day I use the spray bottle which will likely be every day? I will be using distilled water when I make it. It seems like it’s a shame to have to make it fresh every day for just a few pumps using the nasal spray bottle. No need to make it every day! Mine is a couple weeks old and still working just as well :-) No refrigeration needed, either! I use Equate (Walmart brand) Saline Nasal Spray, 3 oz $3.32. I don’t know where you all buy your nasal spray from. I just bought some for a couple of dollars. I use these and even my ENT Dr. told me to do so. Had no idea saline solution was so expensive. DH gets has a prescription for artificial tears & a nasal spray (our plan has no co-pay). Sure would be worth it to ask your Dr. for a prescription, especially if you need it for eyes. I wouldn’t want to risk a DIY eye saline that somehow gets compromised. Nasal spray I’d be ok trying though. Jilly, what do you do with the vinegar when you boil it? My daughter is in need of surgery because of her sinuses being extremely blocked. I am looking for solutions to help her avoid it. I’m interested in finding things she hasn’t tried yet, which aren’t many. This one is something I haven’t heard of. Be sure you don’t use homemade saline with contact lenses. Tap water is a source of acanthamoeba, which will cause a visually devastating corneal infection called acanthamoeba keratitis. Another option is to fill a clean sink with warm water. Put in enough salt so that it tastes like your tears. Dunk your face in, blink your eyes, and gently inhale water through your nasal passages. It seems a bit scary at first, but it becomes a welcome ritual. I’ve also tried a few drops of hydrogen peroxide instead of the salt based on a series of products from High Performance Hygiene, which alas, does not seem to be available any longer.